Post Road Residential was scheduled to present plans for a 160-unit mixed-use residential building on Parcel 5 in the 195 District. The meeting has been postponed. Parcel 5 is bounded by Wickenden, South Main, South Water, and Dollar Streets on the east side of the Providence River. The proposal calls a 5-story c-shaped building with 160 apartments and 6,490 square feet of commerical space. The building features 160 parking spaces in the interior of the ground level with entry to the garage via Dollar Street. The presentation posted by the 195 Commission does not show any renderings, so materials and what the building actually looks like is still a mystery. What is shown feels very Avalon at Center Place, not a great urbanist feeling. The lack of retail could be concerning, but brick and motar retail is getting difficult. The Wickenden face is commercial and the corners at Dollar Street are as well. I’m assuming the mass along South Main and South Water Streets is townhouses opening to the street, something we don’t have a lot of in Providence. It is something that you see everywhere in Boston though, and it can be good urbanism. 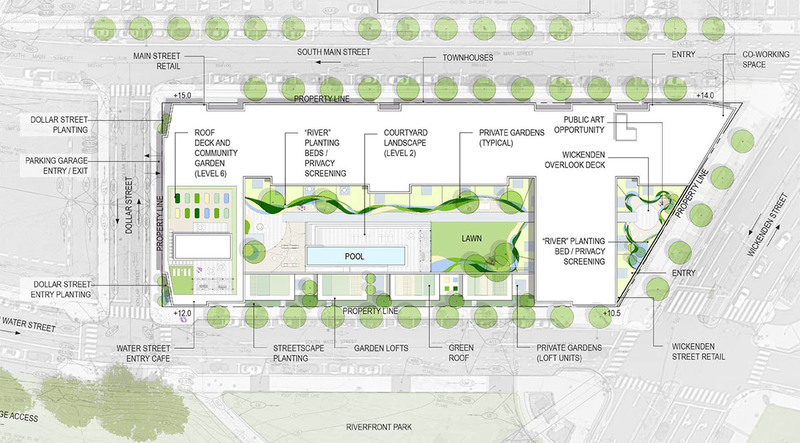 Without seeing proposed materials and renderings, this one is hard to judge. Of the three proposals, I found this one to be the most feasible sounding. I think it really hits the development intensity potential of Parcel 5, unlike the Spencer proposal, which I think is aiming too low. Also, I think it is the right move to provide only a small amount of storefront retail on this site. Let the separate Wickenden and South Main business districts be themselves and don’t try and link them together. Check out some of their recent work, such as The Corsair, in New Haven, that comes pretty close to an aesthetic that would fit in well on this site. I’d like to see them bump out more of the sidewalk at the corner of South Water and Dollar so that the cafe can have very generous outdoor seating in warm weather. It should be a popular spot. I don’t know what the park plans are now, but once-upon-a-time there was a children’s play area targeted for the riverfront park across the street from here. The cafe could get a lot of business from that if that is still the plan.